← Ontario’s Task Force Releases its Phase 1 Recommendations to help people suffering from chemical sensitivity but health ministry abdicates again. Here’s a new take on that report. 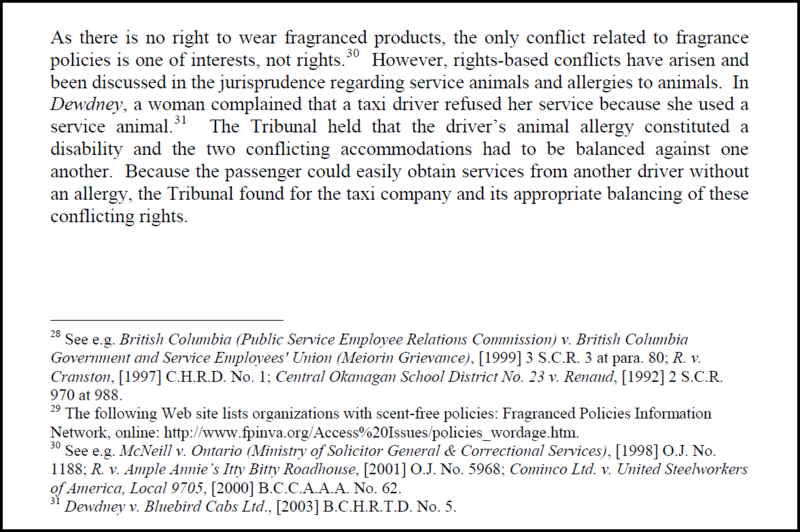 This entry was posted in Air Quality, Environmental Sensitivities, Human Rights and tagged accommodation, chemical sensitivity, Fragrance, fragrance-free, IAQ, invisible disabilities, legal rights, MCS, MCS/ES, policy. Bookmark the permalink. I have heard from so many people who have been harmed by their health “care” providers. Makes me wonder what they are putting in fragranced products to make them so addictive that even medical people won’t give them up. “34.7 % of the population reported one or more types of adverse health effects from exposure to one or more types of fragranced products. PS everyone, I have no control over the ads that get posted here. Please report any that are inappropriate here due to being toxic and/ or accessibility barriers by clicking where it says “report this ad” under the ad!